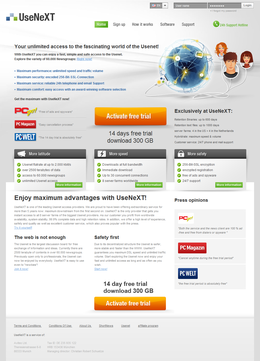 Usenext is a German company that provides fast, reliable Usenet service at a fair price. You can use Usenext from anywhere in the world, as they have access to a number of large server farms in the U.S. (on both the east and west coasts) and in Europe. During your 14-day free trial, you can download up to 300 GB (gigabytes) of data for free. At the beginning, you get a nice treat: the first 5 GB of data is downloaded at unlimited speed. That is, your throughput is limited only by the speed of your Internet connection and your computer. After 5 GB, the speed is limited to 2Mb/sec for the rest of the free trial period. I have tested Usenext myself in a variety of ways and found it to work well. I was able to download all kinds of files — small, large, and very large — quickly and with no problems. What sets Usenext apart from other Usenet service providers is the quality of their free software. Once you sign up as a customer, even for the free 14-day trial, you can download the software for free. The software is a powerful Usenet newsreader created by a Hong Kong-based company called Tangysoft. Tangysoft describes their software as "The Newsreader for Smart People" and a "sophisticated and customized" program. I would have to agree: they are right on both counts. As a Usenext customer, you can download the Tangysoft newsreader — also known as the "UseNext newsreader" — for free. Once you install it, you will see that it integrates seamlessly with the Usenext service. All you have to do is enter your username and password: everything else is automatic. The program comes with only basic instructions. However, if you have any experience at all, you will find the interface to be most intuitive. For example, with no previous experience, I was able to search for and download files (literally) within seconds. The newsreader comes with a free, easy-to-use search facility that itself is worth the price of the service. In addition, there are a number of unexpected features, such as access to an online chat system (just click on the "Chat" icon), as well as an easy way to search Google Groups (click on the "Search" icon and then the "Articles" tab). To browse newsgroups, click on the "Newsgroups" icon. To search for files, click on the "Search" icon. In both cases, you will find that the newsreader comes with a variety of pre-configured categories. To create categories of your own, click on "Newsgroups" and then "Manage Newsgroups". To edit the pre-existing categories, click on "Newsgroups" and then "Newsgroup Wizard". Then click on the "Download List" button to download and display a list of all the newsgroups, so you can choose the ones you want to add to a category. Summary: Usenext provides fast service at a fair price with free powerful, easy-to-use software. 1. Because Usenext is a German company, when you explore their Web site, you will find a few features that will look a bit odd if you are not German. For example, when you sign up for the free trial, you must enter your address. In many countries, you would type the street number followed by the street name. In Germany, the street name comes before the number, and this is what you have to do when you fill out the form. Such idiosyncrasies will be either charming or mildly disconcerting, depending on your point of view. 2. You can get free technical support by using the "Online Support" page. Just fill out a form and your answer will arrive by email. If you are in a hurry, there is a phone number you can call on the "Support Hotline" page. There is no charge for support. However, if you are outside Germany, there will be a toll charge to call the number.